Workshop 1: Friday June 18: 6 p.m. to 11 p.m.
Workshop 2: Saturday June 19: 1 p.m. to 6 p.m.
Workshop 3: Sunday June 20: 1 p.m. to 6 p.m.
Pricing for US residents will be the same as for Chicago workshops, in U.S. dollars. McLaughlin College can be accessed from Ian MacDonald Blvd. McLaughlin College is located in the top central area of the map, due south of the Founder's Rd. entrance to the campus, marked #51 on the map. The nearest visitors parking lot is the Founders Rd. East Lot, marked #66 on the map. Please included your full name, address, contact info, and which workshops you would like to register for with your registration fee. Please make checks payable to Anna Melnikoff. Once the location is confirmed, there will be a short list of inexpensive local accommodations posted on this page. 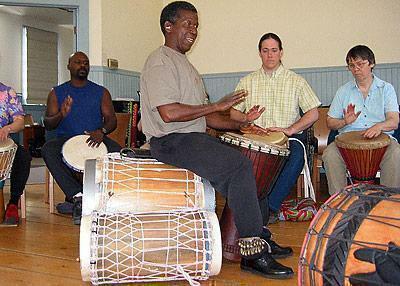 Please bring your own Djembe. 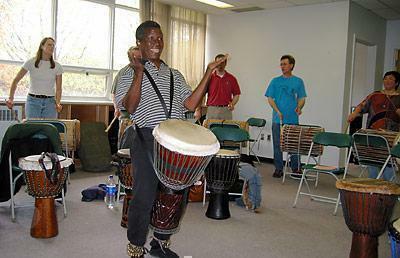 If you have Dunduns (kenkeni, sangban or dununba) and are willing to lend them for the duration of the workshops, please contact Anna Melnikoff prior to June 14, 2004, bolokelen@sympatico.ca or call 416-944-3589.